5 DIFFERENT RESISTANCE BAND LEVELS - X Light (15-30 lbs), Light (15-35 lbs), and Medium (30-50 lbs), Heavy (40-60 lbs),and X-Heavy (45-70lbs). Multiple uses,Comfortable elastic Stretch Bands for legs, glutes, shoulder, hips, & arms enhances all aspects of Health.Many people use resistance bands for physical therapy and every popular workout program including Yoga, Pilates, and more at home too,Yoga bands, exercise bands. Portable packaging,you can take them along in a purse or briefcase in the included carry bag. 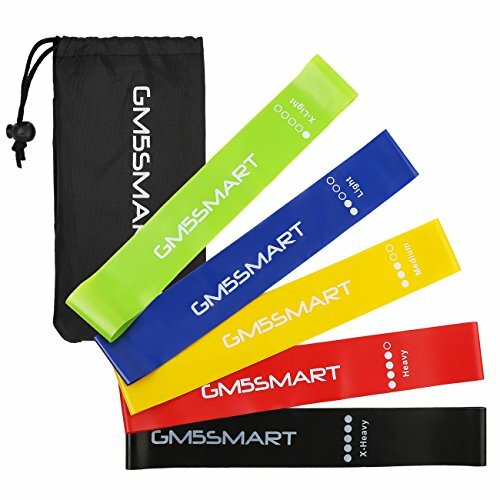 What you get:5 different resistance band levels,Portable packaging,printed manual and 100% lifetime satisfaction guarantee.